This image is a raytraced rendering done in Persistence of Vision's Raytracer in late 1996. 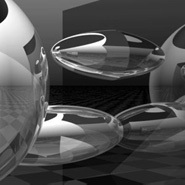 There is no visual interface for this program and three dimensional elements must be defined using the text based coding of POV's Raytracing language. A print of this image was first displayed at the '97 Student Art @ Artspace gallery exhibit in New Haven, CT. It also won first place at the '97 Sterling Arts and Crafts Fair. 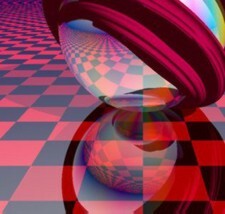 This image was also done in late 1996 using the POV-Ray raytracer programming language. A print of this image was first displayed at the '97 Student Art @ Artspace gallery exhibit in New Haven, CT. It also won honorable mention at the '97 Undergraduate Student Art contest at Koenig's Art Center. © Adam Z Lein, 1998 All artwork property of Adam Lein, unless otherwise noted.